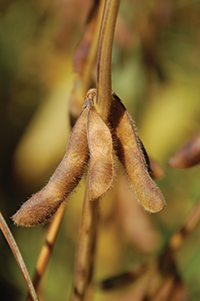 Inoculation with soybean rhizobia is essential for a first-time soybean field in Manitoba, but is it necessary for subsequent soybean crops in that field? 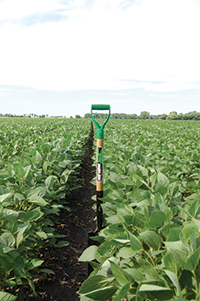 inoculant recommendations can be fine-tuned. Inoculation with soybean rhizobia is essential for a first-time soybean field in Manitoba, but is it necessary for subsequent soybean crops in that field? To answer this question, a grower would need to answer some other questions, such as what is the current soybean rhizobia population in that field, and what population level would be sufficient for good nitrogen fixation in a soybean crop? A study led by University of Manitoba microbiologist Dr. Ivan Oresnik is working towards answers for such questions. Rhizobia are soil bacteria that form symbiotic relationships with legume plants. When living in nodules on a plant’s roots, the rhizobia provide nitrogen to the plant. In turn, the plant provides the rhizobia with carbon and energy. The symbiotic relationship is very specific – each type of legume requires a particular bacteria species. For soybean, the species is Bradyrhizobium japonicum. Oresnik’s study, which is funded by the Manitoba Pulse Growers Association, has two objectives: to develop a rapid assay to quantify B. japonicum populations in soil samples; and to investigate how B. japonicum populations develop in Manitoba fields after inoculation. In other soybean-growing regions, B. japonicum has been known to survive in fields for many years once it has become established, even if soybean is not grown on those fields. But it’s not known how well it will survive in Manitoba soils. Inoculation with soybean rhizobia is essential for first-time soybean fields in Manitoba. “In just a single gram of soil, any soil, there are thousands or tens of thousands of different bacterial species,” explains Oresnik. So the assay needs to be able to distinguish Bradyrhizobium japonicum from all the other bacteria in a soil sample and to count how many B. japonicum are in the sample. Oresnik’s research team is using a technique called real-time quantitative polymerase chain reaction, or qPCR. This technique involves generating thousands or millions of copies of a piece of DNA so those copies can be used for things like genetic identification. Oresnik explains that, with a qPCR-based method, it would take a matter of hours to determine the population of B. japonicum in a soil sample. In contrast, the traditional approach, which involves inoculating plants and seeing how many nodules form, takes about four to five weeks and is very labour intensive. The researchers are making good progress in developing the methodology for their qPCR assay. They currently are working on making it more precise, so that it identifies only B. japonicum and no other rhizobia species. Rhizobia are quite a big group of bacteria that includes 12 genera, such as Bradyrhizobium, Rhizobium and Mesorhizobium, and over 60 species. Several species of Bradyrhizobium have been identified; Bradyrhizobium japonicum is the best known of these. The researchers’ next step is to take a closer look at exactly what the assay is measuring and not measuring. So this winter they will be sequencing the DNA from all the bacterial species in their soil samples, and then they’ll relate that complete picture of the bacterial community to what the assay is measuring. One reason for doing this whole-community analysis is that the assay has detected something that looks like B. japonicum in fields that have never had a soybean crop and have never been inoculated with B. japonicum. Oresnik thinks it might be an indigenous species that’s closely related to B. japonicum.